Old map by LAPIE -Planispheres Celestes. Publisher: LAPIE, P & E.
Size: 15.0 x 22.2 inches. Condition: In fine condition with a very light damp stain in the top left corner. 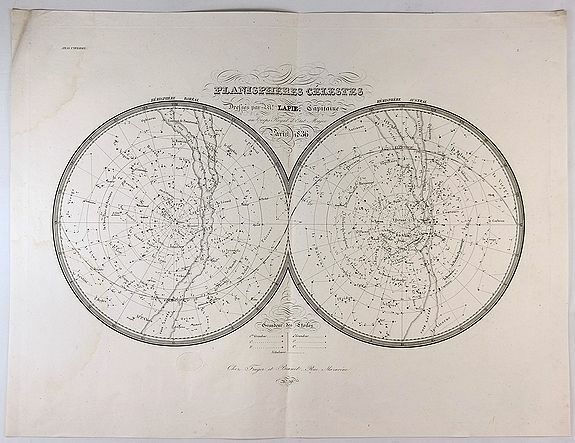 A striking celestial chart in the form of two spheres showing the position and courses of the planets in the northern and southern hemispheres. Includes the Ecliptic, the great circle of the celestial sphere that is the apparent path of the sun among the stars. A legend at bottom identifies the relative sizes of the stars. 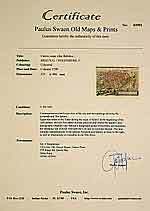 There is an embossed blind stamp for “Atlas Universel” just below the Hemisphere Boreal. Pierre M. Lapie (1779-1850) and his son Alexandre Emile Lapie (1809-1850) were French cartographers and engravers, active in the early part of the 1800’s. Alexander enjoyed the title of "First Geographer to the King", and this title appears on several of his atlases. Both father and son were exceptional engravers and detailed cartographers.